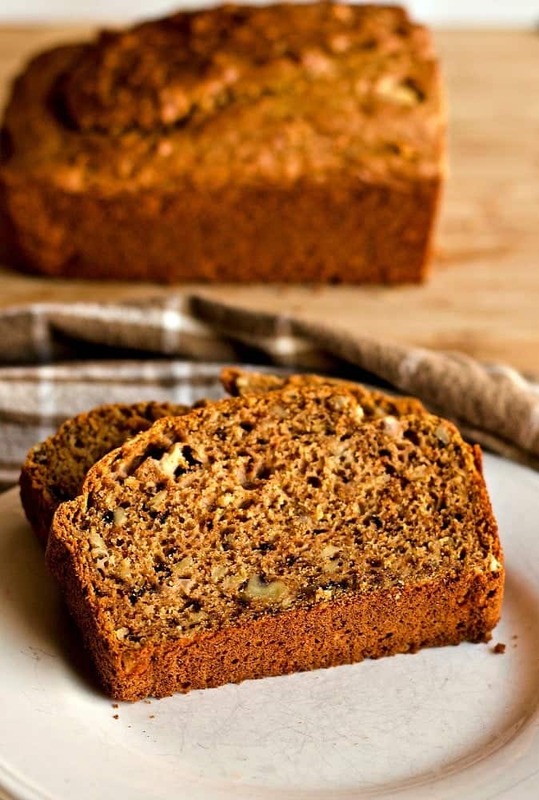 Sweet Potato Apple Bread is full of delicious, healthy, natural ingredients. Make your family a heart healthy comfort food that will nourish their bodies and please their taste buds. This moist, rich bread is full of flavor your family will love! Quick breads are an easy way to use up extras in your kitchen. That’s how this recipe came to be. I had apples and sweet potato puree that needed using. Tada! Yummy new recipe. I adore quick breads as a healthy carby snack, breakfast lunch or dessert! Sweet potatoes and apples are an amazing flavor combination and work together well nutritionally too. Sweet Potato Apple Bread (as all breads) has lots of delicious comfort food carbs. 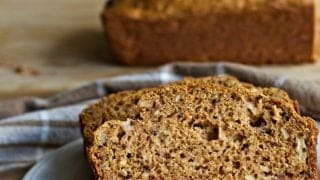 The ingredients in this particular loaf also has loads of great supporting ingredients to keep you smiling while your family enjoys a healthy snack. I made Cinnamon Spice Apple Bread recently and the naturally sweet apples helped reduce the extra cup of sugar in that recipe too. I love when the food can show itself off in a recipe and does not need to be masked with a lot of processed sugar. That works for Sweet Potato Apple Bread too. Maybe even better! 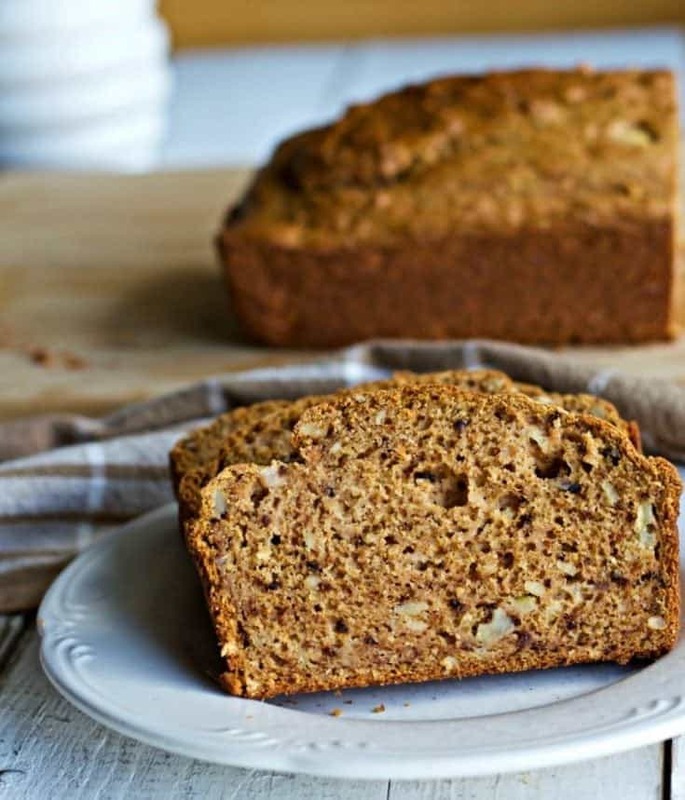 Sweet Potato Apple Bread is full of chunky apple bits and walnuts for a moist texture and bit of nutty crunch. I use maple syrup in this recipe for a sweetener. Walnuts and avocado oil provide a bit of added healthy fat and texture. I also made my own instant pot steamed sweet potatoes puree. You can follow my link if you have an [easyazon_link identifier=”B00FLYWNYQ” locale=”US” tag=”homefoodjunk-20″]Instant pot[/easyazon_link] or cook your sweet potatoes any way you prefer. Mash them into a puree and they are ready. Sweet potatoes and apples are both naturally sweet and extremely good for you. A bit of maple syrup (read about the health benefits of Maple syrup) is all the added sweetener this recipe contains. I’m using avocado oil in combination with sweet potatoes because Avocado oil is an amazingly heart healthy oil. It’s a good oil to bake with AND IT HELPS YOU GET THE MOST NUTRIENTS OUT OF SWEET POTATOES. Sweet Potatoes contain NO oil at all. Interestingly, Sweet potatoes need healthy fats to help release and properly digest the nutrients they offer. Avocado oil is especially good at helping with nutrient absorption so that’s why I’m using it. Read this in depth WHfood article for more on sweet potato nutrition facts. Read their page about the health benefits of apples too. Food is fascinating! Back to the recipe. In almost every quick bread we bake we add almond extract flavoring. My niece Meghan taught me that trick in her Blueberry zucchini bread recipe. She learned it from her mama and now I’m passing the family secret to you! Almond flavoring really picks up the flavor and enhances any vanilla flavoring you add as well. Give it a try! It you don’t have almond flavoring, vanilla will suffice. Developing this recipe was a bit of a fight for me. I knew what I wanted but getting there required several attempts. I finally adapted my Pumpkin Zucchini Bread Recipe. Pumpkin and zucchini are not as naturally sweet as sweet potato and apples. I was delighted I could cut the sweetener in HALF for this recipe. With a few other adjustments, this recipe is just what I wanted. A heart healthy Carby bread that needs no butter (but go ahead if you want to) or extra sweetening. Just slice and bite. Like Pumpkin, sweet potatoes are very high in fiber. So are apples. That makes the carbs is this recipe easily digestible and filling. This bread is easy and quick to put together! If you have the ingredients handy and the sweet potato puree made ahead, all the time is in chopping the apple and nuts. I used my food processor for both the nuts and apples. I made my sweet potato puree in my [easyazon_link identifier=”B00FLYWNYQ” locale=”US” tag=”homefoodjunk-20″]instant pot[/easyazon_link] as the video below shows you. I have made this bread with both fresh and frozen apples. Either will work. Measure frozen apples frozen not thawed for best results. Like most quick breads the oven time can be a bit finicky. The ingredients affect the timing. Various types of apples have different moisture content. Homemade Sweet Potato puree can also vary a bit. Ovens also vary. Do not remove the bread until your toothpick comes out clean. The instructions tell you to beat the wet mixture for about five minutes until it thickens and turns a pale color. This will help leaven the bread. It may not thicken a lot but this step will help you get a light loaf. Whisk wet ingredients in a larger separate bowl. Chop the apples and nuts (I pulsed mine in my food processor several times) Stir the apples and nuts into the wet ingredients. Pour the dry ingredients into the wet and stir together until just combined. Pour the batter evenly into two greased 9 x 4 inch loaf pans and lightly smooth the top. Bake for about 60 minutes until a toothpick inserted in the center comes out clean. After removing from the oven the loaves will still be cooking for a few minutes. let the loaves sit in the pans about 10 minutes before turning them onto a cooling rack. Please share your results in the comment section below. 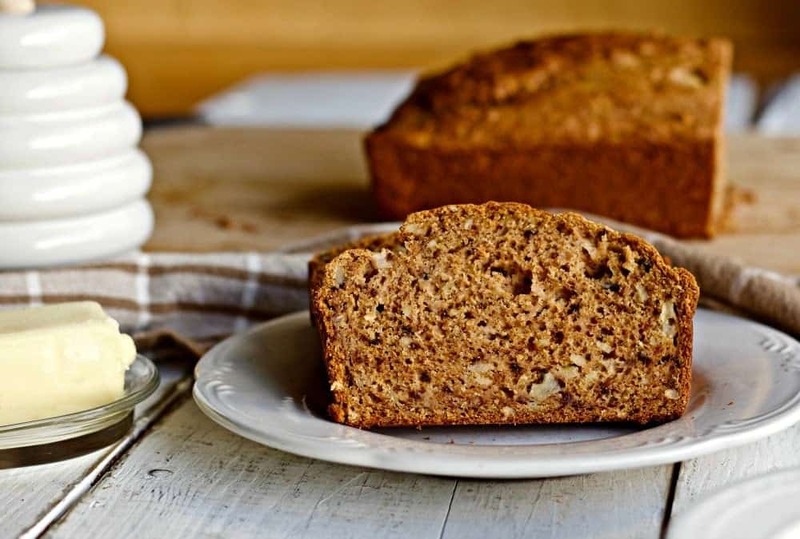 Sweet Potato Apple Bread is full of delicious, healthy, natural ingredients. Make your family a heart healthy comfort food that will nourish their bodies and please their taste buds. This moist, rich bread is full of flavor! With an electric mixer mix wet ingredients in a larger separate bowl until the mixture gets thicker and more pale(about 5 minutes).